I have been debugging software for the last 20 years, and although things have changed, I realize I took it for granted and never really thought about it. There were two debugging technique if was introduced to when I started. Attach a debugger to a program and hit breakpoints. When you hit a breakpoint, the debugger can show you your source code because the symbols have a mapping from the assembly code to the source code. At a breakpoint you can inspect variables, change their values. You can control the flow of execution of your program by executing the next instructions and even change what the next instruction is. This technique is a bit more brute force, but consists of using logging to get insight into code which is hard to debug with breakpoints. Although less efficient than breakpoints, I have done this soooo often because it allows me to debug also in cases like production, where I might not be able use breakpoints. Step forward a few years and we now have Visual Studio 2017. Both techniques above still work but with a few new features. For example, for logging we don’t have to use the console but have access to Trace and Debug, both with listeners to output where you want. Even better are TraceSources, which are specialized objects for logging for modules. 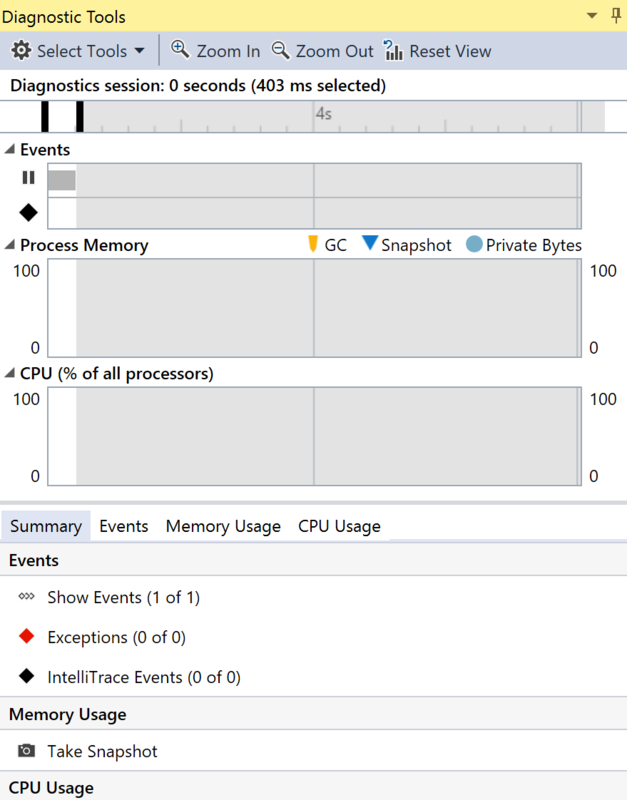 Always making things easier, VS also shows us a few graph about memory and threads. To complement the advances in the platform, there are a bunch of other logging frameworks such as nlog, log4net, serilog… One of the advance i love about these frameworks are the concept of structured logging, imagine logging with DTOs. While we are on the subject, there are even logging frameworks as a service, all cloud based ! One of the bigger breakthroughs in debugging we got a few years ago was called edit and continue. You can literally change code of running programs as they run… Quite interesting although I cant say have used this mechanism often. This requires Visual Studio. The second one which has served me well is IntelliTrace. This is basically a configuration based approach to automatic logging – as the debugger hits different places (breakpoints) in the code, events are generated with some contextual information. For example – File.Delete() will generate an IntelliTrace event with the text “File asdf.txt deleted”. This is great as all major components of dot net are instrumented with this technology. IntelliTrace requires Visual Studio but using the offline IntelliTraceCollector, you can record the execution of your code and analysis everything in Visual Studio. The newest feature which is currently in preview is called Time Travel Debugging, which basically allows your to execute your code… in reverse. You can go forward into your code’s execution as well as backwards, just look at the ribbon in WinDBG Preview (available in the Windows Store). I haven’t had the chance to play with this too much, but it looks very fun, as it will allow you to go back in time in a break point within a loop… The recorded traces have to be viewed with WinDBG. Another new feature which i think i will love is the concept of snappoints and logpoints. Imagine the ability to attach to a running process, but instead of pausing the process when you hit a breakpoint, a myriad of information gets recorded when a snappoint is passed. You could then inspect the variables and stack trace of every one of those hits without causing impact. Logpoints are dynamic logging, pass this instruction and add this event to the log. These are great advancements to the art of debugging. This feature requires Visual Studio and Azure hosted sites. I hope you are excited about the future of debugging !